Glacial striations are scratches in the surface of the bedrock/parent rock resulting from rock fragments that are trapped in a glacier and being dragged at its basal point. Glacial striations can be various depths, lengths, and widths for a variety of reasons including the composition of the rock fragments, composition of the bedrock/parent rock, and the size of the glacier. Glacial striations are a useful resource in both modern glaciology and paleoglaciology in regards to mapping glacial movement. In education, students need to know that glaciers are so powerful they are capable of physically altering the face of the Earth in long-lasting ways. For my project, I am developing a lesson plan for first graders that will introduce how glacial striations occur. The focus of the lesson is for students to gain an understanding of the relationship between the rock fragments at the basal point of a glacier and the bedrock/parent rock through analogous activities. Student progress will be informally assessed through the students completing the provided table handout and writing an explanatory paragraph in their science journals. The Northeast Greenland Ice Stream (NEGIS) is an important feature to study when looking at sea level change. Heat from geothermal sources causes basal melting at the base of these glaciers, causing them to slide towards the coast and refreeze inside the glacier. Geophysical methods allow us to observe and identify these processes. However, due to the rough environment and terrain of Greenland it is difficult to conduct most geophysical methods in this area. Center for Remote Sensing of Ice Sheets (CReSIS) uses airborne radar and ice core data collected from the Center for Ice and Climate to study the surface velocity and subsurface features. Radar data allows us to look at the dielectric properties of the subsurface by measuring the two way travel time and amplitude of the returning wave. Using MATLAB we can create a depth profile of the subsurface in order to identify the main layers and features. This can be compared to ice core drilling which provides actual measurements of the physical and chemical properties of the subsurface. Integrating the radar with ice core data allows us to be more confident when characterizing the subsurface. Understanding the internal features of NEGIS is vital to studying how fast melting and sliding is occurring and the impact it will have on the sea level. The Center for Remote Sensing of Ice Sheets (CReSIS) has developed many radars that operate over the frequency range from 140 to 230 MHz with multiple receivers developed for airborne sounding, and imaging of ice sheets. Understanding the echogram data depends on knowing the process of how radar waves interact with natural surfaces. With more data being retrieved along with thickening layers of ice, researchers look into new techniques to enhance their radar imagery for efficiency. The purpose of this project was to use the Bas Relief filter for image processing in order to improve the interpretation of radar imagery. The filter Bas Relief, currently in Photoshop, was once a sculpture technique in which figures or other design elements were just barely more prominent than the overall background. 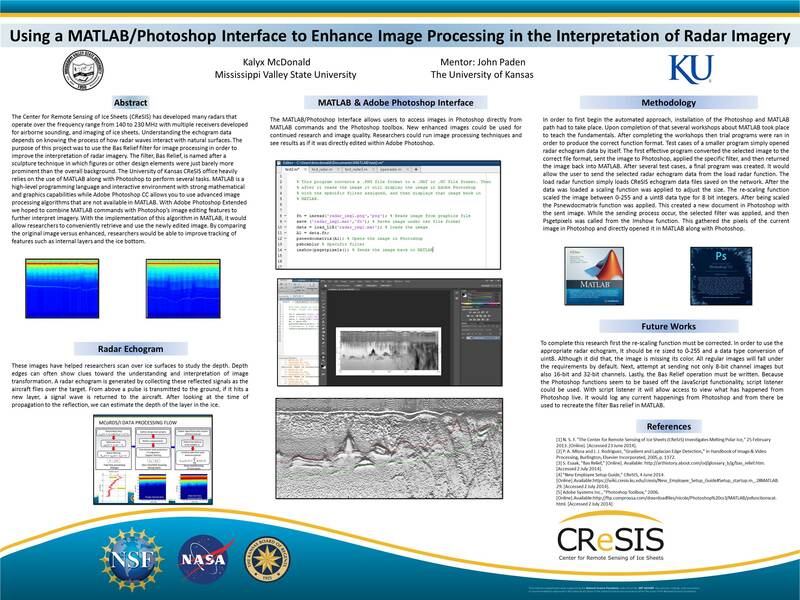 The University of Kansas CReSIS office heavily relies on the use of MATLAB along with Photoshop to perform several tasks. MATLAB is a high-level programming language and interactive environment with strong mathematical and graphics capabilities while Adobe Photoshop CC allows you to use advanced image processing algorithms that are not available in MATLAB. With Adobe Photoshop Extended we hoped to combine MATLAB commands with Photoshop's image editing features to further interpret imagery. With the implementation of this algorithm in MATLAB, it would allow researchers to conveniently retrieve and use the newly edited image. By comparing the original image versus enhanced, researchers would be able to improve tracking of features such as internal layers and the ice bottom. Glaciers are receding at a more rapid pace than predicted in previous years. Glacial retreat occurs when ice or snow is removed from glaciers through ablation. When ablation occurs faster than snow accumulates water is added to oceans which, over time, will cause sea levels to rise. Glaciers hold about 69% of the world’s fresh water supply. The complete melting of this land ice can affect sea level rise by 70 meters in the next century. This study focused on how the Jakobshavn Glacier is the fastest retreating glacier in Greenland and its impact on sea level rise in the not too distant future. One way to raise awareness about climate change and its imminent impact on civilization is to incorporate Geographical Information Systems (GIS) in K-12 learning. ArcGIS software also advocates education reform by applying inquiry-based learning tools to develop students’ critical thinking and problem solving skills. Using imagery collected from Landsat satellites 1-7 students will be able to utilize GIS mapping software to visualize and analyze these changes over time in relation to future sea level rise. In electrical circuits and systems switches are used to change the state of the system between different modes of operation. In the Multichannel Coherent Radar Depth Sounder (MCoRDS) and other ice penetrating radars used by the Center for Remote Sensing of Ice Sheets (CReSIS) a single antenna is used for transmission and reception of radar signals, unlike other systems which use one antenna for transmission and one antenna for reception. In this case, a switch must be used in this radar system (“T/R switch”) in order to transfer between these two modes of operation. To collect as refined data as possible when flying close to the ice surface the “lag time” of the T/R switch must be minimized. The T/R switch is controlled by a driver circuit, which translates a logic timing signal from the radar into the voltages and currents required by the switch to change states. For optimum operation of the radar system, the driver must be capable of switching states in less than 1.5 us including driver delays. Additionally, the T/R switch for this system must be capable of handling up to 1 kW of RF power. Positive-Intrinsic-Negative (PIN) diodes are commonly used as control elements of high-power T/R switches capable of handling more than 1kW of RF power. Switching speeds of about one tenth of the diode’s carrier life time have been reported in the literature for the fastest diode drivers (not including driver delays). For my project I built and tested a new circuit driver provided by Aeroflex Microelectronic Solutions, which is expected to provide switching speeds better than 500 ns. The project involved capturing a schematic diagram on the computer using a printed-circuit-board computer aided-design (CAD) program; fabricating the circuit; testing it; and comparing with simulations to verify the performance of the driver with a T/R Switch. Sea level rise has evolved from theory into fact and the consequences of this continual rise will have a profound effect on the infrastructure, economy, and weather patterns of major coastal cities. Current projections of sea level rise range anywhere from .5 meters to 2 meters globally by 2100 with more extreme projections showing up to 3 meters. As for the consequences in the United States, extreme weather poses a significant threat to New York City with the “100 Year Flood” becoming a much more frequent event. Despite these projections, many coastal cities continue to build which will result in a massive economic loss as the coastline diminishes. The economic impact of holding back the sea, which could reach as high as $111 billion, could leave some cities, such as Miami and New Orleans, making the very difficult decision to forfeit infrastructure. 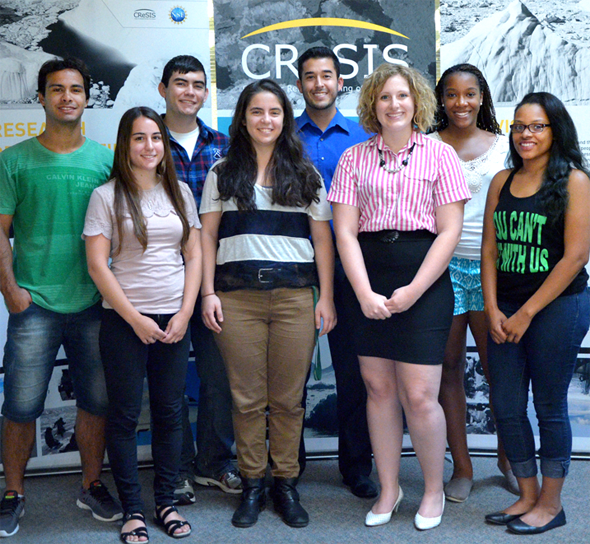 The educational purpose is to inform young students about the issue of sea level rise that is more relevant to them apart from simply focusing on the Artic regions, as well as providing a proactive response to the issue by educating youth at an early, primary level, age. The lesson will simplify this advanced topic to be suitable for grades 3 through 6. The objective will be understanding how sea level rises, such as knowing the difference between an ice berg and glacier, and how sea level rise can affect a coastal city using the 5-E model and a hands-on activity that will be assessed through journal writings based off of their findings. Snow radar data from the Siple Coast was collected during the month of December 2013/January2014 field season. The goal of this study is to characterize internal layer patterns over the Siple Coast region that can be used to determine snow accumulation rate. Darker and thicker layers seen from snow radar images seem to align with volcanic events, providing a dating constraint to the layers that can be used to establish accumulation rates. Six layers will be analyzed within the data set. Ice core data in the region is used to estimate the dates the layers were formed. The findings of this study will establish changes in the accumulation rate over the Siple Coast region and the spatial extent that these patterns of snow layers cover. They will also explain what events caused each layer to form. Soaring can be defined as flight in which an internal thrust mechanism is not present. It is known that some birds have developed some techniques of extracting energy from the atmosphere; for instance, Turkey Vultures make use of the uplifts to reduce their energy consumption, allowing them to migrate to distant places. Humans, observing this phenomenon from nature, developed aircraft (gliders) capable to similarly use this energy which comes from diverse sources. Basically, three types of soaring are known: thermal, orographic or dynamic, and previous work has provided physical models for them which can be incorporated to the aircraft dynamic model. Thus, the main objective of this project is to couple the existing models of environmental uplifts and thermals with the unmanned aerial vehicles dynamics in a manner that can reduce the aircraft fuel consumption and, consequently, enhance the UAV flight range and endurance. In addition, the goal is to have a model which can predict the total energy variation to predict of soaring instantaneously from different sources (thermal, orographic, dynamic or combination of them). Such model could be used in any geographic coordinate and would be applicable on many environments and aerodynamic configurations.